Vitality and enthusiasm that are offered by the Sun, reigning element of Leo, is combined with the quietness of the Moon converting these natives in warm and generous people. 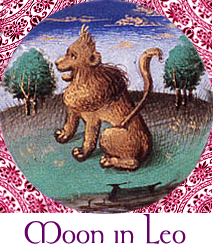 The influence of the Moon is one of the most important elements that we need to take into account when dealing with the Leo daily horoscope. In leohoroscope.net, we usually talk about expressive people and people who love to have the attention of the others. Their emotions are sincere and very deep, being also able to unchain dramatic scenes or too exaggerated. They do not think about expenses to satisfy their whims as well as to make happy to their loved ones. They love to be the center of attention and when they are ignored, they can be in a very bad mood. They have fun understanding the others and usually taking the role of the funny person in any chats or events. They have the need to have everything under control and even to command relatives and friends. People born with the Moon in Leo need a lot of love and attention of their loved ones in order to be able to function in this world and to shine with all the vitality they have. When thy feel threatened is when madness can come out and the great scenes of irritability are present. Making them reason is, in almost all the cases, a simple task if people make them see the sense of justice and love for truth. These natives are very interested by their image and they usually demand the same to their partners.